I am taking a break from being pissed at Rei. I'm still not over the fact that she didn't design a kid's line for H&M, and I'm still upset that the H&M dress will cost a whopping 350 smackers. 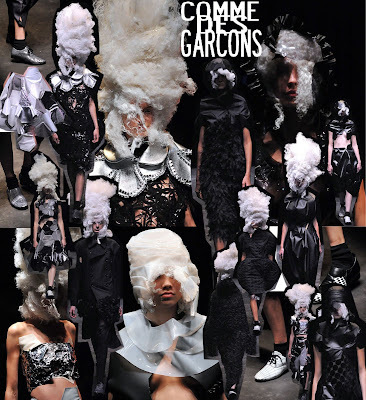 But-BUT-the Comme Des Garcons line is out. And it is my duty to report. HOWEVER, Rei, this dies NOT mean I have forgiven you. I am still darn tooting ANGRY over your H&M line, however amazing it may be. I am still very, VERY mad over the pain and suffering you have caused me. The nights of sobbing, the days of watching day time television and eating sugary cereal. I'm almost scarred for life. Do not even TRY to apologize. Oh screw it. Why even pretend. I LOVE THE SANTA CLAUS BEARDS, AND THE ITCHY LOOKING HAIR, AND THE SOCCER BALL SHOES, AND THE TIN FOIL TOPS, AND THE BEAR COSTUMES, AND THE WHOLE GENIUS THING. Besides, once you think about it, you can't hold a grudge forever, can you? I mean, think of all the Fashion Weeks to come! So really, this is beneficial for both of us. A mature person would get over it and forgive you, so that's what I'll do. So now that I've forgiven you...how about you give me a few of those craycray wigs for free? And maybe we could also go out to lunch? I'll buy you waffles? Oh Rei, I'm so glad we're friends again! Now we're gonna talk aboot who's getting fat, and who's getting anorexic, and we'll pig out on ice cream since you're too old to care and I'm too young for it to matter, and we'll have tea parties where we bring our teddy bears and Japanese Street Style Girl dolls, and-GASP-we should buy the same clothes! And MATCH! And then we can be TWINS! Oh, Rei! I'm so glad you have excellent design skills that overpower my usually very persisent grudge-holding abilities! Come on BFF, let's go buy matching narcissistic Karl purses! Oh Rei, I just love being best friends!